As you enter the home through its purposefully simple exterior entryway – reminiscent of classic European country homes – you step into a foyer with an impressive 21' high ceiling. 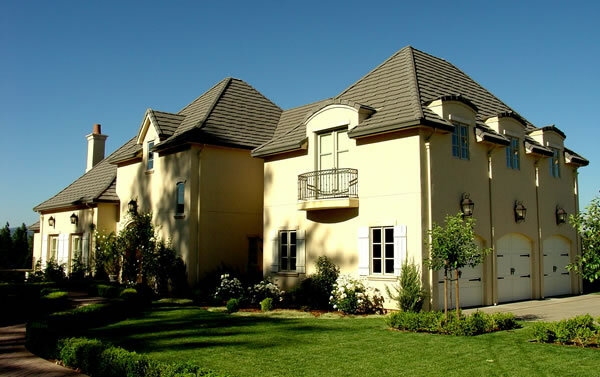 Immediately on your left there's a coat closet and a beautiful arched opening to the great room. On your right there's an elegant stairway that wraps around a powder room. And a swinging door brings you to the kitchen area. As you step into the great room the (false) beamed ceiling rises to a dramatic 12'! There's a large energy efficient Isokern fireplace on the far wall, two pairs of glazed doors on your left that open and look out to the front yard, and a door next to the fireplace that opens to a private library. This room has a 10' ceiling and a pair of windows that look out to the front of the house. From the great room, you pass between columns and beneath 10'–high bulkheads to enter the dining, which like the great room features a 12' ceiling. Custom 9'–tall archtop French doors on the far wall open to a large covered and enclosed patio space with another Isokern fireplace that is a perfect spot for entertaining. 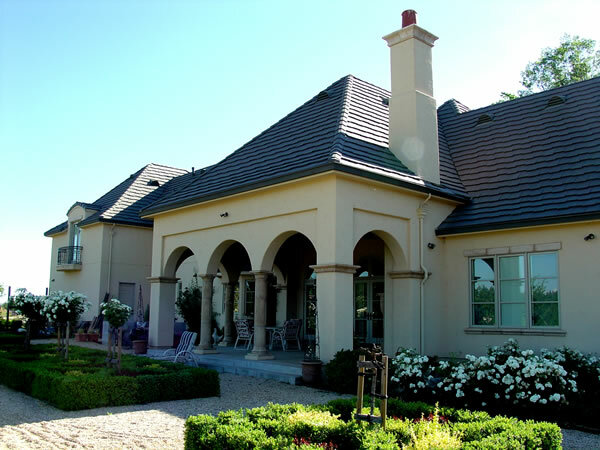 The patio also has a 12' ceiling, and is surrounded by Tuscan columns and arched openings. Adjacent to the dining room is a beautifully appointed gourmet kitchen. It features a 10' ceiling, a bump–out window bay wrapping around the sink area, a large island with cabinets below, a huge walk–in pantry, a six–burner range, and tons of counter space with cabinets above. A short hallway passes a laundry room and a powder room (that can be accessed directly from the back yard) on the left and a coat closet on the right before reaching the 3–car garage. 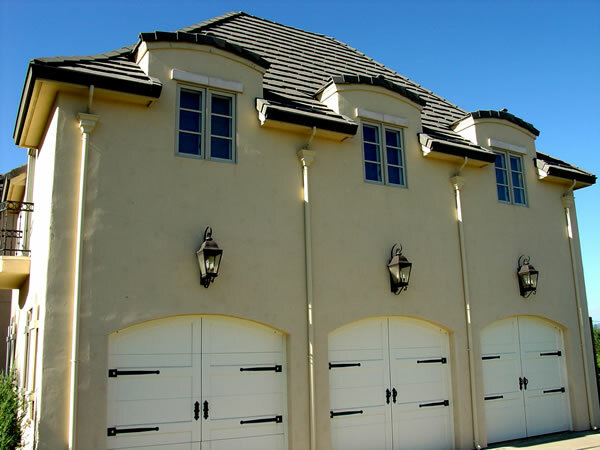 The garage has direct access to the exterior and to the large pantry for ease of unloading. The rest of the main level is devoted to the master suite. The master bedroom (like the rest of the suite) has a 10' ceiling. Windows that look to the rear provide light and views, and a door next to them opens to the master bath. An arched opening frames a 72"x42" soaking tub set beneath windows, and next to it is a separate shower with a built–in seat. There are two vanities, a private toilet room, and a spacious walk–in closet with a small window at one end. The upper level features 3 bedrooms, each with their own private bathroom. Each has a 9' ceiling, a walk–in closet, and plenty of windows for light and views. Bedrooms 3 and 4 each have angled ceilings at the edges, built–in window seats, and small private balconies. A pull–down ladder in bedroom 4's closet provides access to a large attic space, so there's plenty of room for storage. There's also a large attic space over the other portion of the house, and a storage closet tucked into the stairway. 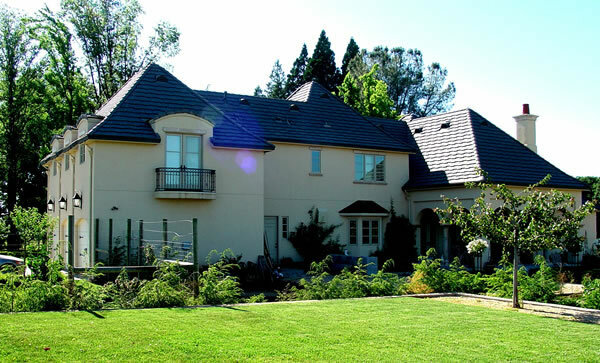 Due to licensing agreements, this house cannot be constructed within El Dorado County, California. 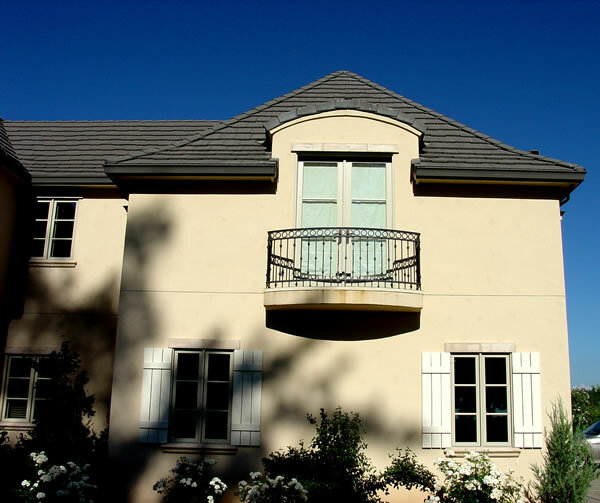 This lovely French country home has a simple yet elegant stucco exterior, along with a slate roof and other beautiful details like copper spires, wood shutters and Tuscan columns. 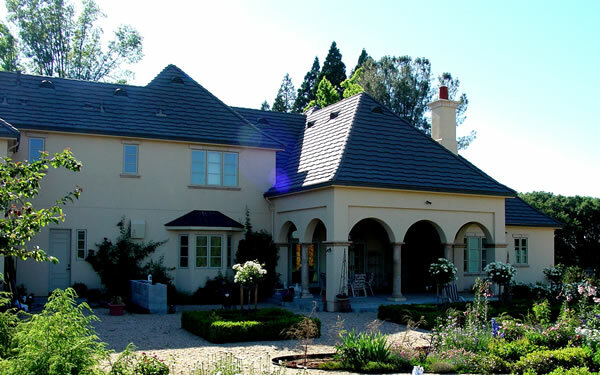 The rooflines are classic French country style, segmented and facing front and rear. The house features – among other things – a large library that could be used as a home office or a guest room; lofty 10' and 12' ceilings on the main level; a master suite that is located on a different level and opposite side of the house from the other bedrooms; and a large patio enclosed by elegant arched openings that has an outdoor fireplace.